"A custom loathsome to the eye, hateful to the nose, harmful to the brain, dangerous to the lung, and the black stinking fume thereof, nearest resembling the horribly Stygian smoke of the pit that is bottomless," railed King James in 1604. But even the throne was too weak to withstand the onslaught of tobacco. And now, 500 years after the ignition of a global wildfire whose toll of death and destruction rivals that of any plague, discussions on the soil from which the sparks arose have implications f or the path of its spread around the world. The facts are well known. In the pre-dawn of the 16th Century, as sailors funded by the royal houses of Europe were dispatched across seas known and unknown in search of new trading opportunities, a small band led by Christopher Columbus happened upon the West Indies. Among the items retrieved was a leafy plant used ceremoniously by the New World inhabitants, and thought to harbor medicinal properties. Because one of the plant's most prominent components, nicotine, turned out to be among the most potent addictive substances yet identified, casual Old World curiosity soon grew to fascination and quickly in turn to widespread use. While Virginia and Maryland were still colonies, tobacco represented fully three-quarters of their export revenues, according to Richard Kluger in his book, Ashes to Ashes: America's Hundred-Year Cigarette War, the Public Health, and the Unabashed Triumph of Philip Morris. Big Tobacco is big trouble. Kluger stated that formal counting began with a report in 1761 by a British physician of 10 cases of cancer among snuff users in London. But even James would have been surprised at tobacco's extensive, deadly reach: cancer s of the lung, larynx, mouth, esophagus, pancreas, kidney, bladder and cervix; heart disease and stroke; bronchitis and emphysema; gastric ulcers; low birthweight; and respiratory distress and sudden infant death syndromes. The Centers for Disease Control's Tobacco Information and Prevention Sourcepage: Overview reported that tobacco accounts for about one out of every five deaths, or some 400,000, in the United States. Globally, tobacco last year killed an estimated 3 million people - about 6 percent of all deaths, and more people than died worldwide from malaria (2 million), diarrheal disease (2.5 million) or AIDS (1.5 million), reveal reports from the World Health Organization (WHO) and UNAIDS respectively. If current trends continue, WHO reports, this figure will grow to 10 million deaths per year worldwide by 2020. Winston "Made in U.S.A." billboard in Russia promises "total freedom." Big Tobacco is also big business. According to a 1997 WHO Global Status Report on Tobacco or Health, the seven largest companies control about 40 percent of the global market, which is both large and lucrative. In fact, in 1997, despite a decline in use of about 1 percent annually over the last 30 years, U.S. smokers spent about $45 billion to buy nearly 500 billion cigarettes, reports Euromonitor: Consumer International 1996/97. But the real market is now overseas. With a 2-percent annual increase in tobacco consumption worldwide, today, 1.1 billion people across the globe use tobacco regularly, WHO reports. In 1997, these users purchased 6 trillion cigarettes (according to WHO) at a cost approximating total sales of the entire global information technology industry, confirms IDC Government, Inc.
For Big Tobacco, the future is in Central Europe and Third World business. Sales abroad already exceed domestic sales for the biggest companies, and marketing in developing economies represents the dominant interest. Between 1992 and 1994, domestic s ales fell for the two largest American tobacco companies, from $18 billion to $15 billion, while foreign sales steadily increased from $16 billion to about $21 billion. Much of this foreign sales growth was in developing countries. For example, Brown an d Williamson/BAT controls 17 percent of the U.S. market, but derives 75 percent of its tobacco sales from developing markets, reported the Wall Street Journal on June 23, 1997. In 1996, Philip Morris earned $12.6 billion in the United States and $24.1 billion abroad, USA Today covered on the same day. Last year the tobacco industry signaled an interest in negotiating "a global settlement" in the United States. The battle which has raged in the intervening year has often seen anti-tobacco forces pitted against each other. Most of the debate has focused on issues such as potential caps on liability suits, the scope and administration of regulatory oversight for tobacco, and the size of the settlement fund and the programs it would support. Scant attention has been devoted in this debate to the central issue of the tobacco companies' future in the foreign markets. Another element, skillfully left off the table by the industry, is equally important on moral grounds: the establishment of a fund for use in global efforts to counter the marketing of tobacco products abroad. A 1994 FTC report to Congress indicated that as WHO was scrimping together $60,000 for its global tobacco-control program, the tobacco industry was spending 100,000 times that much - $6.03 billion - in the United States alone for tobacco advertising and promotion. Without the assistance of enhanced resources, public health workers in developing countries simply haven't the means to combat the overwhelming marketing forces of the industry. Big Tobacco is bargaining for the right to continue to produce and market a product proven to be among the most lethal and addictive substances known, and to turn its dominant marketing efforts abroad. As the U.S. Congress contemplates comprehensive tobacco-control legislation, policy leaders have a fundamental obligation to ensure that tobacco-related decisions made on American soil do not amount to unfettered license to kill on foreign soil. Empowering, educating and protecting children and adults everywhere from the hazards of tobacco is not only critical. It is a matter of national responsibility and honor. Tobacco use is rising worldwide, particularly among women and children in developing nations. The result will be horrific: Cigarette smoking will lead to early death for more than 200 million children and teenagers alive today. Smoking is an addiction that must be addressed early, as trends in the United States so clearly demonstrate: Nearly all U.S. adult smokers picked up their first cigarette as children, and each day, 3,000 more become regular smokers. A University of Michigan study released last year showed smoking among American high-school seniors at its highest level in 19 years. One-quarter of these students smoke, a 43-percent increase in the daily smoking rate in the last five years. In addition, 12 percent more smoke occasionally, a habit that will likely lead to addiction within a few years, according to the researchers. A current study just released by the U.S. Centers for Disease Control and Prevention reports smoking rates for U.S. high schoolers increased from 27.5 percent in 1991 to 36.4 percent in 1997. Among available tobacco choices, 42.7 percent of students reported using cigarettes, smokeless tobacco or cigars during the 30 days preceding the survey. The Centers for Disease Control have found that 86 percent of children who smoke prefer Marlboro, Camel and Newport - the three most heavily advertised brands - compared to only one-third of adult smokers. Between 1989 and 1993, when advertising expenditures for the Joe Camel campaign jumped from $27 to $43 million, Camel's market share among youth rose by more than 50 percent, while its adult market share remained the same. 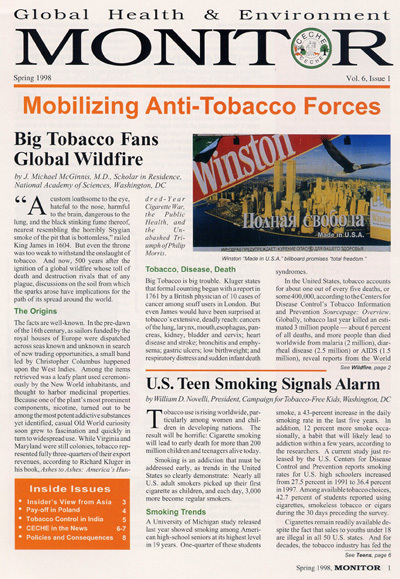 A February 18, 1998 article in the Journal of the American Medical Association reports that University of California researchers found that promotional giveaways, such as free hats and sports bags with tobacco logos, have a more dramatic impact on teenage smoking than print advertisements. Recent signs, however, suggest a leveling off of smoking rates among U.S. eighth graders, and the tobacco industry is coming under unyielding attack by state attorneys general, anti-smoking coalitions, Congress and the Clinton administration. In fact, Congress is now considering legislation, that would greatly strengthen a proposed $368.5 billion settlement in 1997, between the tobacco industry and state attorneys general. Such legislation, if enacted, could give the U.S. Food and Drug Administration broad regulatory power over tobacco, substantially increase cigarette prices, reduce smoking in public places, and put limits on tobacco advertising and promotion. What does this unprecedented assault on the tobacco industry in the United States mean for the rest of the world? As the tobacco companies lose ground in the United States, they will continue to focus attention abroad, where their marketing messages w ill be received and heeded by millions of men, women and children. The Campaign for Tobacco-Free Kids and many other organizations are working to battle the tobacco industry on a global basis and draft U.S. legislation that can help other nations kick the habit and prevent smoking in the first place. The United States cannot solve this global problem by itself, but it can take steps that will have benefits for public health worldwide, including: promoting tobacco control internationally, with emphasis on securing financial and diplomatic support; ending U.S. government promotion of the sale or export of tobacco abroad; and providing major funding for public education, technical assistance, smoking cessation and research internationally, with a special focus on developing countries. In addition, many tobacco-control efforts within the United States could be adapted to other nations, such as clean air laws that are difficult for the industry to counteract. At the same time, the United States can learn from the tobacco-control experiences of other countries. Strong, strategic advocacy initiatives can help change the social and political environment so that tobacco is not seen as part of a nation's everyday life. The tobacco wars can be won. If organizations and governments work together, we can prevent millions of deaths through cooperative strategies and a worldwide attack on tobacco marketing and sales. Given the statistics, there's no time to lose.